Tanna of the end of the first century C.E. Although the proselyte Onḳelos is frequently confounded with the proselyte Aquila in the Talmud and the Tosefta, even the designation of the official targum to the Pentateuch as "Targum Onḳelos" being based on this confusion between the two proselytes (comp. Jew. Encyc. ii. 36 et seq., s.v. Aquila; see Targum OnḲelos), yet there is no reason to doubt the existence of a tanna by the name of Onḳelos (Αγκυλος or Αγκυλιων = "crooked," both forms occurring as proper names; see Pape, "Wörterb, der Griechischen Eigennamen," 3d ed., i. 11). This Onḳelos originated the explanation that the cherubim had their heads bent backward in the manner of a pupil when leaving his teacher (B. B. 99a). This statement being quoted as a tannaitic sentence, it is impossible to substitute here "Aquila" for "Onḳelos," the Scriptural comments of the former in the Talmudic Midrash literature always being quoted as those of a translator and not of a tanna. As a characteristic of Onḳelos is mentioned his extraordinarily strict observance of the Levitical laws of purity; he observed in his daily life the same laws of purity that Scripture commands at sacrifices. He surpassed on this point even the patriarch Gamaliel II., who also was extremely rigorous in these observances (Tosef., Ḥag. iii. 2-3). Once, when both were at Ashkelon, Onḳelos took his ritual bath in the sea because he held that the bathing-places outside of the Jewish territory were not fit to be used; the patriarch, however, was not so rigorous (Tosef., Miḳ. vi. 3). The relation between the two seems to have been a very close one, as Onḳelos is almost always mentioned together with the patriarch (in addition to the passages quoted, comp. Tosef., Kelim, B. Ḳ. ii. 4); hence when R. Gamaliel died Onḳelos arranged a costly funeral by burning spices and other materials that were used at the burial of royal personages (Tosef., Shab. vii. 18; 'Ab. Zarah 11a; Sem. vii.). It is related, as an example of Onḳelos' piety; that on coming into possession of the property which his pagan father had left to him and his pagan brother, he laid aside those things that were forbidden to the Jews, nor would he exchange them for anything else, as he might legally have done (Tosef., Dem. vi. 13; Yer. Dem. 25a reads "Aquila" instead of "Onḳelos," but it has been by no means proved—notwithstanding Frankel and many other modern scholars—that Yerushalmi has the right reading). There are a number of Talmudic legends concerning Onḳelos. He is said to have been the son of a Kalonymus, or, according to another version, of Kalonikos. When he had become a convert to Judaism, the emperor sent a cohort to take him prisoner, but Onḳelos converted his would-be captors by citing Biblical sentences; this happened no less than three times. The fourth time he was taken prisoner because the soldiers had strict orders not to speak with him. They noticed, however, on leaving the house, that he laid his hand on the mezuzah, and had the curiosity to ask what it was; whereupon the proselyte gave them such an answer that they also were converted: thereafter he was left in peace ('Ab. Zarah 11a, top). This story, and also the legend of the acts of necromancy which "Onḳelos, the son of Kalonikos, and sister's son of Titus," performed before his conversion to Judaism (Giṭ. 50a; comp. Jew. Encyc. l.c. ), are probably only the Babylonic versions of legends that had gathered around Aquila and Flavia Domitilla in Palestine. At Babylon hardly anything was known of the proselyte Aquila, while Onḳelos was known through the tannaitic traditions; hence legends that were really connected with the former were transferred to the latter proselyte. This explains also the statement of the Babylonian Talmud (Meg. 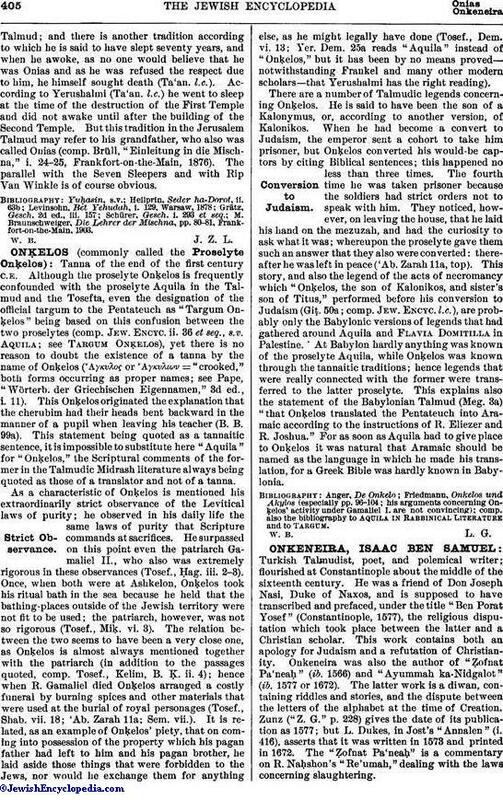 3a) "that Onḳelos translated the Pentateuch into Aramaic according to the instructions of R. Eliezer and R. Joshua." For as soon as Aquila had to give place to Onḳelos it was natural that Aramaic should be named as the language in which he made his translation, for a Greek Bible was hardly known in Babylonia. comp. also the bibliography to Aquila in Rabbinical Literature and to Targum.